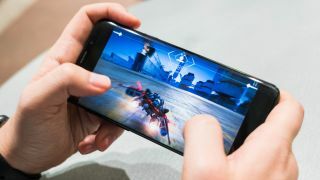 With the increasing popularity of games like PUBG Mobile and Fortnite, smartphone manufacturers are cashing in on the trend with their take on gaming smartphones. While it is not true that normal smartphones can't run games, largely the experience differs when you play a game on a dedicated smartphone that's made for gaming. Having said that, there's still a dearth of good gaming titles for phones which is why gaming smartphones target a very niche audience. Currently, PUBG Mobile is all rage in India and you'll need a high-quality device for the best gaming experience. Some of the highest-rated phones in our top 10 list are simply the best devices on the market with top-tier specs, sharp displays and long battery life. Our recommendations consider processor and GPU speeds, RAM size and other odds and ends. The top gaming phones don't just play the best smartphone games without a hitch, they’ll also maintain the best visuals and performance for games coming over the next few years. Think about the phones below as future-proofing your next device into the year 2020. The OnePlus 6T is one of the best smartphone to play PUBG Mobile in India. It's one of the fastest Android smartphones available in the market and even though you get the best Android experience on Google Pixel, the OnePlus 6T is just faster at everything. The phone is also available with 6GB/8GB RAM and 128GB/256GB internal storage options. If you're on a lookout for the best iPhone to play games on, you might as well go with the best. In this case, that's the iPhone XS Max. The 6.5-inch Super AMOLED screen on the iPhone XS Max is the biggest ever on an iPhone and supports HDR playback for an enhanced viewing experience. Its larger battery manages to stay working nearly a full hour longer than the standard iPhone XS. That, coupled with the fact that the iPhone XS Max is powered by the A12 Bionic processor which is 40% more efficient and 50% more powerful than the older Apple processor. For gamers, speed is a very crucial element when it comes to online gaming and the iPhone XS Max is able to run titles like Clash Royale, Asphalt 9 and PUBG Mobile with much ease. All this in Apple's sleek and modern look – though it's the most expensive mainstream phone on the market, even before including all the bells and whistles. It has a couple of added features for gamers such as the air triggers which are essentially touch-sensitive buttons on the top-right and top-left of the phone (when held in landscape) are cool, customizable ways to play that a typical smartphone just doesn't have. The phone has a cooling system which consists of a carbon cooling pad, copper heat dissipation unit and a 3D vapor chamber for improved CPU cooling efficiency. Staying true to its Republic of Gamers army, users can buy additional accessories such as the clamshell case, Nintendo Switch-styled controllers, to augment their gaming experience on the Asus ROG phones. While the Note 9 doesn't have the fancy toys or RGB lighting that the next couple gamer-designed phones have, it has a serious advantage: availability. You can pick up a Note 9 in most physical or online gadget outlets. Sorry, Asus ROG and Razer phones.